My associations with people from Netherlands have always been extremely positive, enthusiastic, optimistically ambitious. 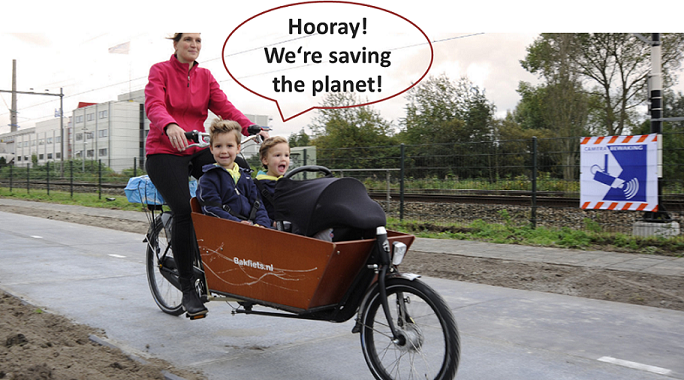 So, it was not surprising that during Nov. of 2014 the Dutch (people from Netherlands) developed the first Solar Bike Path (with embedded solar cells) in the world, outside Amsterdam connecting the suburbs of Krommenie and Wormerveer! 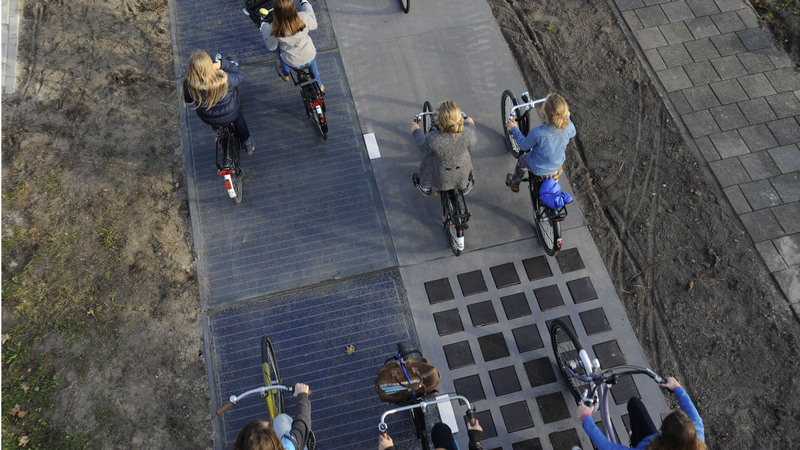 This Dutch project integrated solar panels into a bike commuter path to generate power to be funneled into the national energy grid. 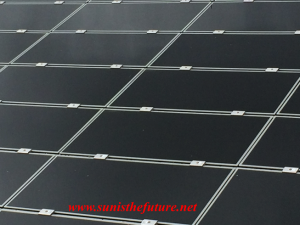 The crystalline silicone solar cells are encased in two layers of tempered safety glass, mounted in a concrete housing. According to SolaRoad, it’s been a challenge to produce energy-producing slabs that are both durable and rideable by thousands of cyclists per day. 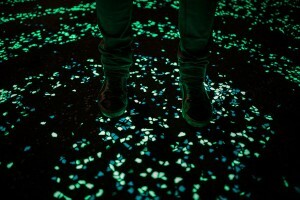 “It has to be translucent for sunlight and repel dirt as much as possible,” the company says. “At the same time, the top layer must be skid resistant and strong enough in order to realize a safe road surface.” This $3.7 million project is a collaboration between the research group TNO and the government of North Holland. Its technical aspects may be found in Phys Org site. 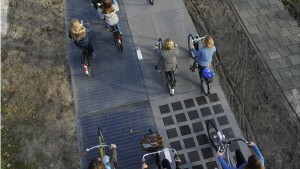 This 70-meter or 230 feet (over two-third of the length of an NFL football field) section solar bike path is flat instead of angled to optimally take advantage of the sun, therefore the path’s panel will produce about 70% of what similar panel might produce on a rooftop. With approximately 87,000 miles of roadways, Netherlands’s total road surface area is much larger than that of rooftops. This project is the first step that the local government hopes will extend to 100 meter (or 328 feet) by 2016. 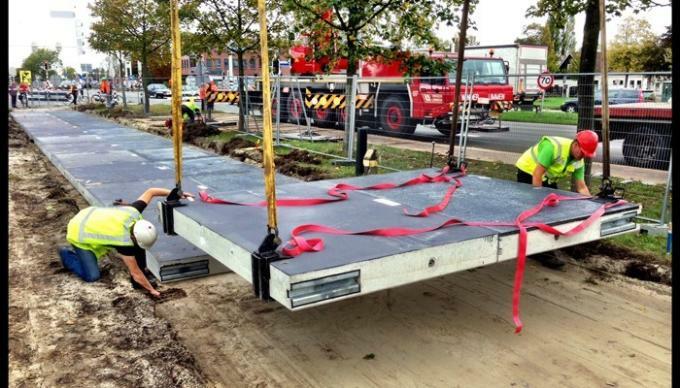 Now that it’s been half year into the installation of the solar bike path, it’s become clear that the solar panels are outperforming expectations, having already generated 3,000 kilowatt-hours (kWh) of electricity. This is fantastic! In a space that previously generated no clean electricity, now it is functioning well and ready for further development and expansion. 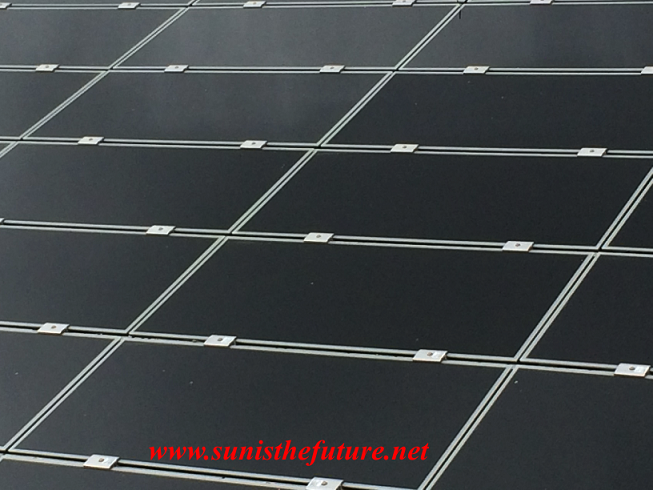 I have no doubt that the cost and overall efficiency of any solar roadway will continue to improve as more and more visionaries collaborate to enable such Clean Solar Renewable Dream of Solar Roadway to become a reality. Our hats off to the visionaries in Netherlands! 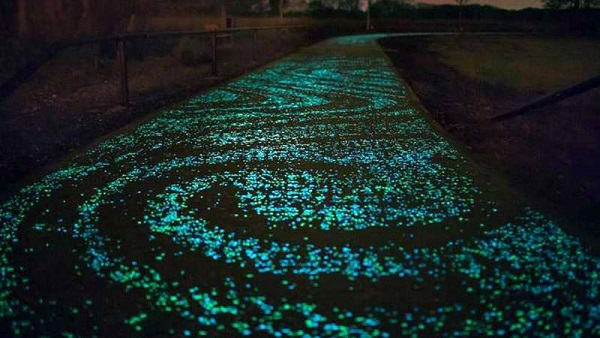 Of course, it is the Dutch who would embrace a challenge by innovating first, by being efficient, in being artistic while pragmatic and remaining connected to both the past and the future……look at the Solar Bike Path at night, an inspiration by Van Gogh’s “Starry Night”. Our future would be simply breath-takingly beautiful, if we don’t destroy our planet first…there lies the beauty of Solar Energy…for it is the answer to Energy-Pollution-Economic Prosperity-Climate Change-International Conflicts. SO, LET’S USE IT ! 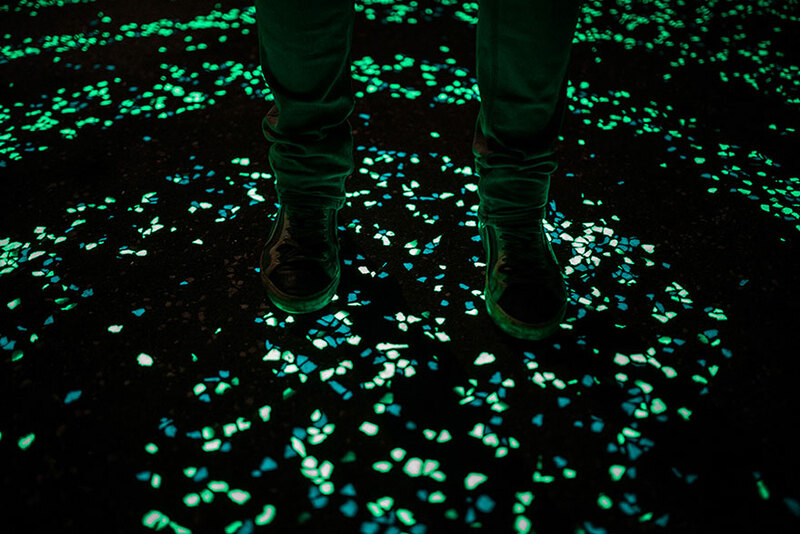 As long as we’re on the subject of solar roadway, let me remind you of the Indiegogo campaign here at sunisthefuture.net for Scott & Julie Brusaw of Idaho, asking for $1 million but ended up raising more than $2.2 million for their Solar Roadway R & D project. Yes, it is exciting to live in a world where dreamers and visionaries are in many places! or plants. This law was the product of compromise between French environmentalists and the more conservative members of the parliament. 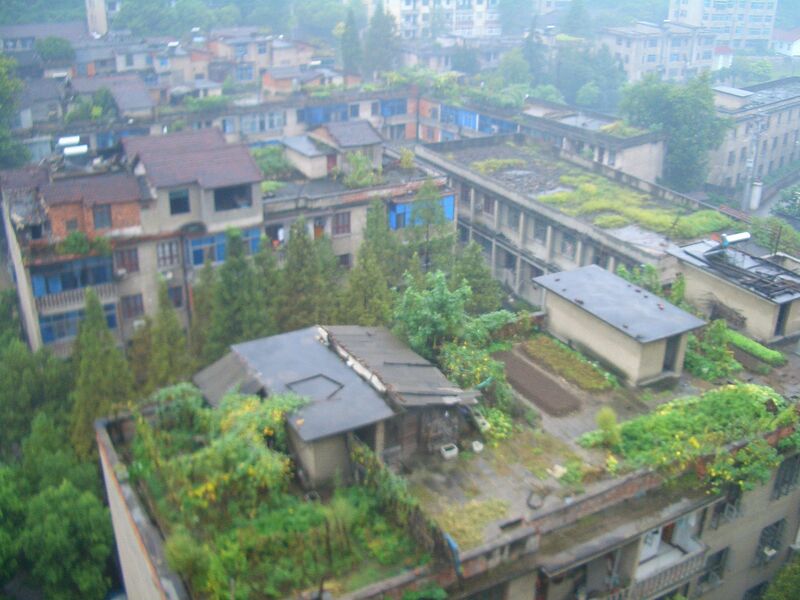 Initially, the French environmental activists wanted to make it mandatory to have all new buildings to be covered with green roofs, but the Socialist government convinced these activists to limit the scope of the law to new commercial buildings/rooftops. 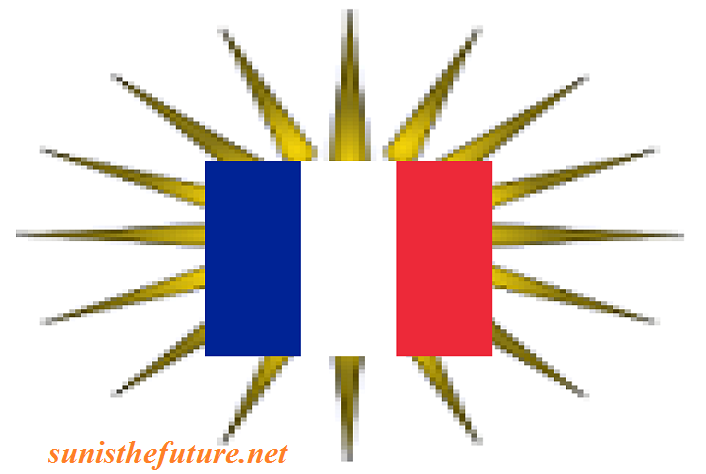 Hopefully, this law will enable France to catch up to its neighbors. Solar PV capacity in France has increased much more slowly than in Germany, Spain or Italy in the past, Reuters reported in November of 2014. In June of last year, France had 5,095 megawatts of PV capacity, accounting for 1 percent of the energy consumption in the first half of 2014. Neighboring Germany had almost 37,000 MW. Other places such as Australia, Germany, Canada, and Britain already have green roofs as part of their urban landscape. 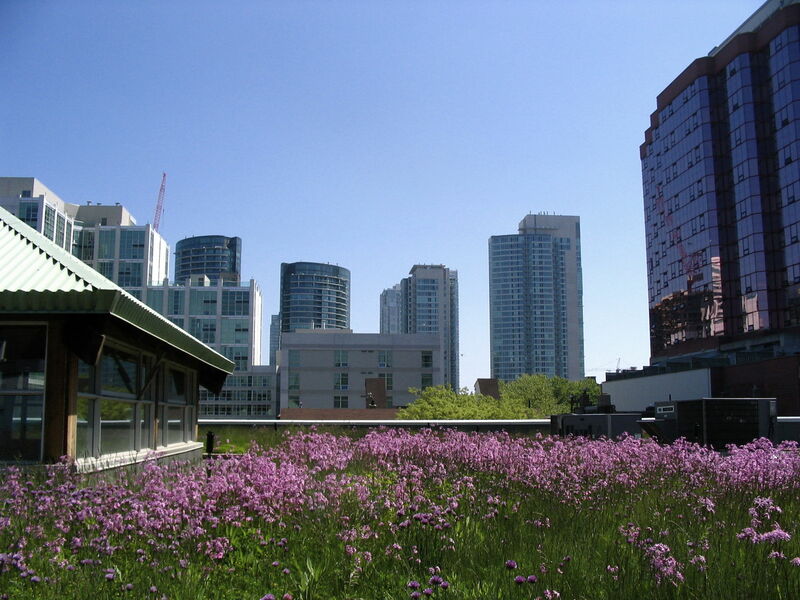 As a matter of fact, Toronto has mandatory green roofs as part of its by-laws since 1998. 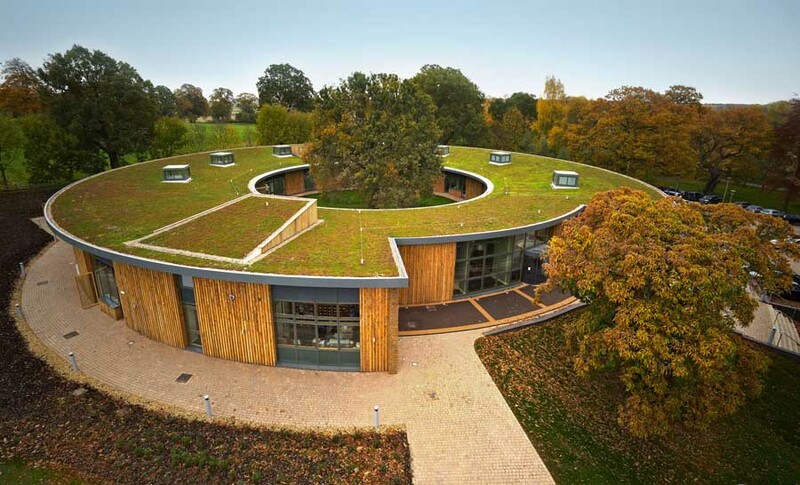 “This draft law is a very positive step forward and a concrete lever for greener and smarter cities,” said James Watson, CEO of the European Photovoltaic Industry Association. 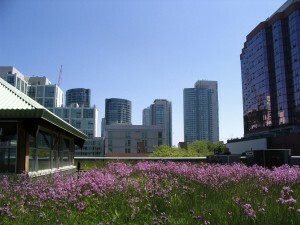 “There are so many unused rooftops in our cities today and solar photovoltaics is the perfect solution to make the best out of them as it can be seamlessly integrated in an urban setting.” Watson added that rooftops, large or small, represent 70 percent of the installed solar capacity in France. “Solar electricity produced on your roof can partially or entirely instantaneously cover your own power needs,” Watson said. In addition to cost saving, please keep in mind that in 2014, solar energy production saved about 110 million tons of carbon dioxide emissions globally. 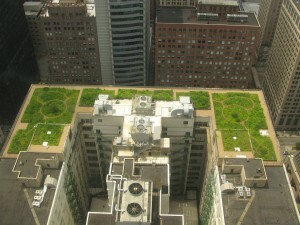 Perhaps all governments throughout our planet should consider utilizing surface areas of the rooftops. Global adoption of solar appears unstoppable now that solar is so cheap. Wind power adoption is rapidly altering energy portfolios around the world. National and subnational energy policies are promoting renewables, and many geographies are considering a price on carbon. The financial sector is embracing renewables-and starting to turn against fossils and nuclear. Coal use is in decline in the United States and will likely fall at the global level far sooner than once thought possible. Transportation will move away from oil as electric vehicle fleets expand rapidly and bike- and car-sharing spreads. Nuclear is on the rocks thanks to rising costs and widespread safety concerns. For more detailed facts and figures, (<–click, please ). Lester Brown and his co-authors have carefully gathered and analyzed the data from the past and provided us a glimpse of what our future has in store. Finally, the inertia from the past is unearthed and we can see the dark curtain is being lifted from the horizon. Our glorious Renewable and Solar/Wind Future has finally arrived! The Dawn Is Here! I would also like to invite you to view the video below, to listen to Lestser Brown’s urging for us to mobilize to save our civilization and be further informed of various data and information availed to us based on the careful gathering and analyzing of data by Lester Brown and his co-authors. The Solar Tsunami WIll Take Powerwall & Powerpack Into An Industry Greater Than $21 Billion ! The Powerwall home batteries designed to be paired with rooftop solar systems received 38,000 reservations. Some customers order more than one battery. Average reservation is somewhere from 1.5 to 2 batteries. Musk described the total demand as “more like 50,000 or 60,000” batteries in early reservations. The Powerwall comes in two designs at $3,000 or $3,500 each. Total Powerwall orders so far is $178.8 million. Tesla has received 2,500 reservations for the utility-scaled Powerpack, usually ordered/installed with “at least 10 Powerpacks”…equivalent to 25,000 units totally at 2.5 million kWh. Musk tweeted last week that pricing for the Powerpack is $250 kWh. Total Powerpack orders thus far is: $625 million. So, Tesla’s grand total for battery reservations during the first week is $803.8 million! They sold out their first year’s production during the first week! 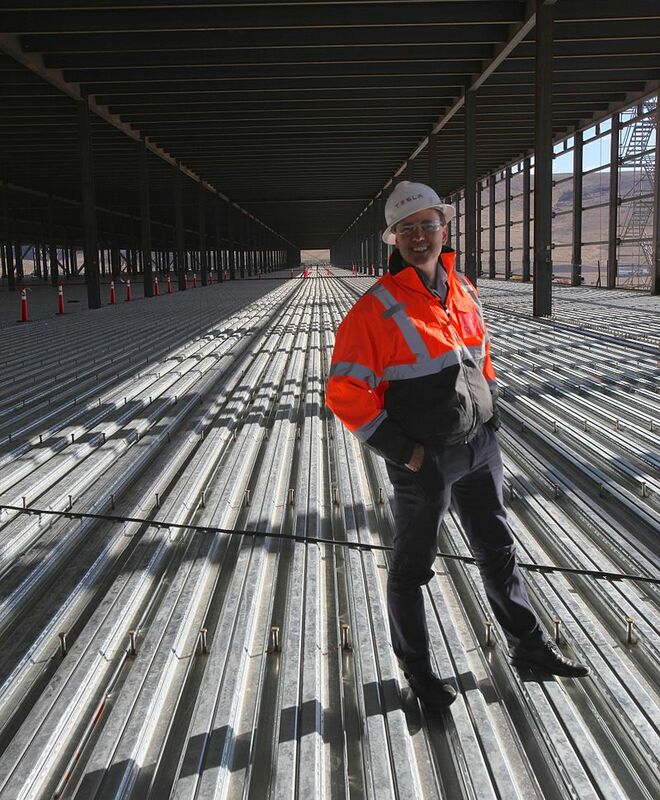 It is no wonder they are already considering expanding the gigafactory after just one week! Tesla is currently also working on projects with Target and Amazon and with electric utilities that include Southern California Electric and Texas-based OnCor. It is not only the individual home owners with distributed solar but utilities are also interested in building battery storage. Batteries can replace some peaker plants while strengthening the grid. With the cost of battery now falling as fast as the solar panels, some electricity from your outlet may soon be coming from battery storage. Powerwall & Powerpack, the cost effective battery storage, have now taken care of one of the arguments against solar, its intermittency. We are seeing the effect of first touch down of previously announced Solar Tsunami ! The world will be a cleaner, healthier, and better place, thanks to Elon Musk’s batteries and Solar Tsunami ! Perhaps Elon Musk’s American dream: a chicken in every pot, a Tesla in every garage powered by solar panels in the roof through Powerwall battery, will soon become a reality. Some people in the energy industry forecasted that although currently $605 million industry, by 2024 it can very well become a $21 billion industry. Of course, many other experts in the field feel that number would be much bigger than $21 billion. I’ve been wanting to share this piece with you for quite some time now because transportation is responsible for almost a third of the CO2 emissions in most developed nations. So I was thrilled to find out about Tindo, the world’s first Solar Electric Bus that are being used every day by the people of Adelaide, Australia, through the Adelaide City Council’s free Adelaide Connector Bus service. 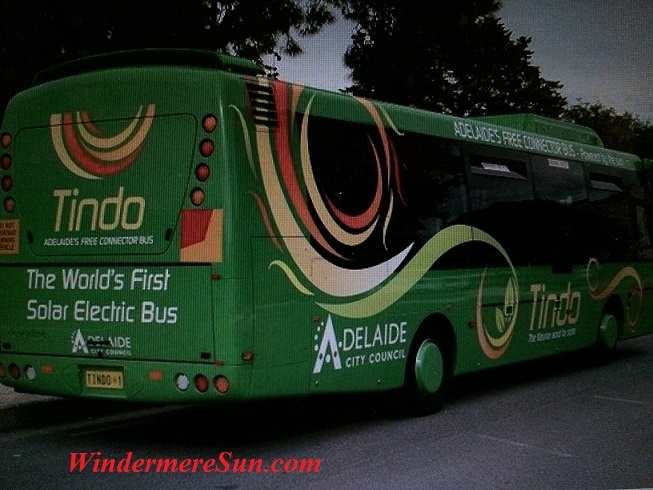 Tindo, the Kauma Aboriginal name for sun, is the culmination of the Adelaide City Council’s eight-year project to deliver a pure electric community bus. Adelaide’s air conditioned 40-seater and low-maintenance Tindo solar ebus is designed by DesignLine International, a New Zealand company. 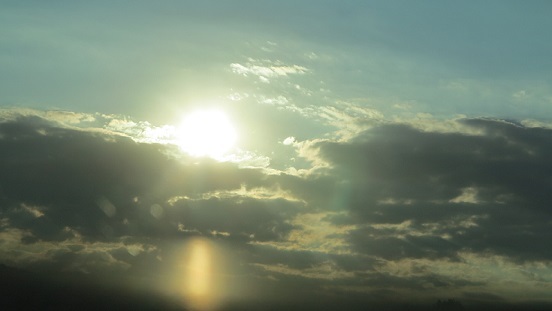 Green public transportation such as Tindo solar ebus is one of the ways to help mitigate global warming. Tindo is recharged using solar PV system at the Adelaide Central Bus station. The solar PV system on the Bus Station’s roof is currently Adelaide’s largest grid-connected system, generating 70,000 kWh (or 70 MWh)of zero carbon emissions electricity each year to offset the total energy required to recharge Tindo’s batteries. Much of the funding for this $550,000 solar PV system was provided by the Australian Government through the Adelaide Solar City program, with the Adelaide City Council also committing significant funding. Adelaide City Council looks forward to the future when a fleet of solar buses will be serving throughout the city of Adelaide. Do you feel the change in the air? We truly are living in an exciting time! Every where I turn, I see the sign of change and transition, including an email that I’ve received few days ago from Earth Policy Institute, about the arrival of a new publication. This is a recently released book titled, The Great Transition, by Lester Brown with co-authors Janet Larsen, J. Matthew Roney, and Emily E. Adams. It is a summary presentation for the worldwide transition from fossil fuels to renewable sources of energy, Solar and Wind Energy. It lays out the rapidly evolving global shift toward cleaner sources of energy, driven by economics, policy, and the reality of accelerating climate change. The authors stress the fact that this shift represents a lasting change in the way we power our world in centuries to come. As fossil fuel resources shrink, as air pollution worsens, and as concerns about climate instability cast a shadow over the future of coal, oil, and natural gas, a new world energy economy is emerging. The old economy, fueled largely by coal and oil, is being replaced with one powered by solar and wind energy. 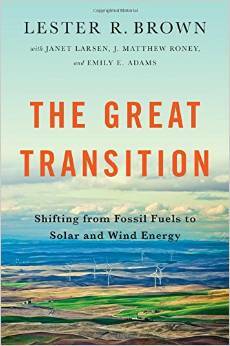 The Great Transition details this trend, focusing on falling prices and rising adoption for wind, solar, electric vehicles, geothermal energy, and energy efficiency; and the emerging turn from coal, nuclear power, oil, and traditional transportation that is happening faster than anticipated. Yes, as seen in some of our previous posts, the change will always be faster than many have previously anticipated. The authors of The Great Transition have also kindly provided us with slides to be shared among people who are interested in the course of energy in human history. They have also helped to shatter some of the old myths popularized by detractors of Renewable Energy in this book. It’s a great read for those who want to have a better understanding of how our world have and will continue to transition from fossil fuels into Renewable Energy Age. Educators and policy makers from different locations are encouraged to utilize this well synthesized information to mobilize or fix our energy system. When Elon Musk speaks, we listen! The electric enthusiasm is palpable in the auditorium! One can feel the energy is ready to boil over….for this is what we (The World) have all been waiting for, the cost effective battery storage technology that would enable us to truly see the transformation of our world! Let this very historical date be remembered, Tesla Motors, rather, Elon Musk, announces the arrival of Tesla Powerwall, on April 30, 2015 in LA. 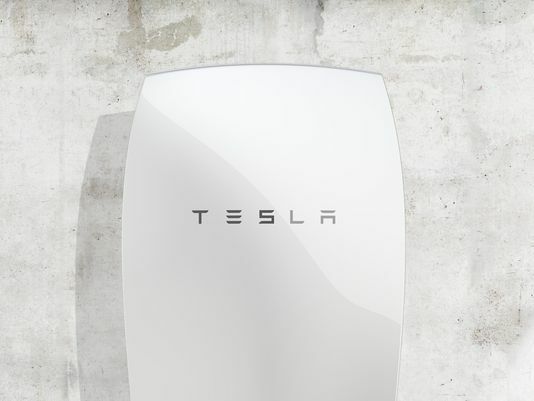 To overcome these shortcomings, Elon unveils for us, on this very memorable day of April 30, 2015, The Tesla Powerwall ! Imagine our future world where batteries would be space-efficient wall-mounted, with a simple and elegant design (choices of colors), with integrated safety systems, thermal control, and dc-dc converter. It would work well with our solar systems. It would enable us to be free from worries about power outage and even potentially go off grid. At the cost of $3,500 (for the 10kWh version and $3,000 for the 7 kWh version) it is the best affordable safe solution to our energy concern. It is also possible to stack up to 9 Powerwalls together, enabling 90 kWh. This is a fantastic solution especially for area with intermittent energy source or remote area: residents from these areas would now be able to meet their energy needs through “Solar Panels with Tesla Powerwall” without the need of electricity lines. This will propell the progress of many remote areas. 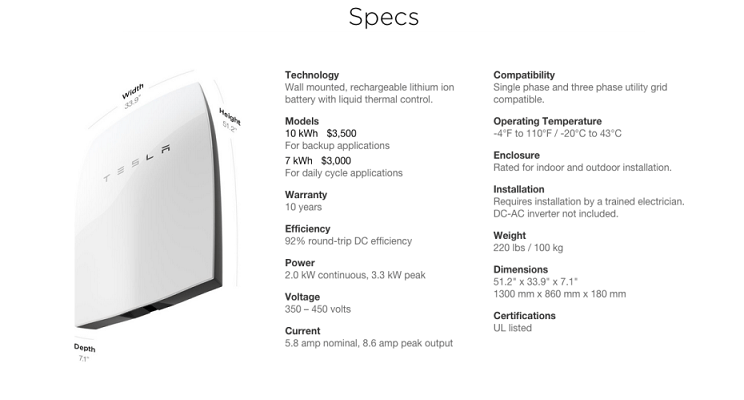 You can order the Tesla Powerwall now by going to teslaenergy.com . They will start shipping in about 3-4 months. More will be ramping up next year as the transition will be made into Tesla Gigafactory in Nevada. Toward the end of the presentation, Elon also brought forth the larger, scalable Powerpack, designed to scale infinitely. An order by a utility for 250 MWh installation (using Powerpack) has already been placed. For dramatic effect, of course, we’ve been presented with the demonstration in an auditorium that is completely powered by the Sun, with storage by the Tesla Powerwall. THANK YOU, ELON! I’ve known that Solar/Renweable energy is the way to go more than 30 years ago (I’m sure that I was not alone), but it took some one like you to help to show us how it can be done! 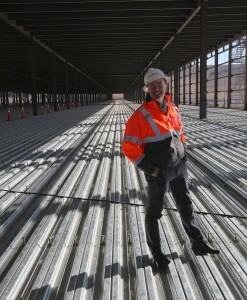 THANK YOU, ELON, for making the designs and plans of gigafactory all open source! So, we earthlings will be able to transition quickly! I am looking forward to the day when CO2 emission will be a thing of the past. Oh, what a clean, efficient, and smart world we will all live in! 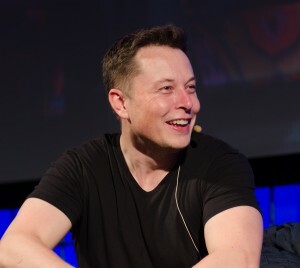 Our future will be bright and sunny because there are people such as Elon Musk on planet earth…who may soon be on other planet(s), with the help of SpaceX!